Review by AllTheBestFights.com: 2019-03-16, good exchanges on the ground between Claudio Silva and Danny Roberts: it gets three stars. The black belt in Bjj Claudio Henrique da Silva entered this fight with a pro record of 12-1-0 (75% finishing rate) and he is ranked as the No.43 welterweight in the world. He suffered his only loss at his professional mma debut in 2007 against Matt Thorpe, since then he has won 12 consecutive bouts defeating Nordine Taleb last year. His opponent, Danny Roberts, has an official mma record of 16-3-0 (75% finishing rate) and he entered as the No.87 in the same weight class. He was defeated by Nordine Taleb in 2017 but he came back to win in 2018 against Oliver Enkamp and David Zawada. 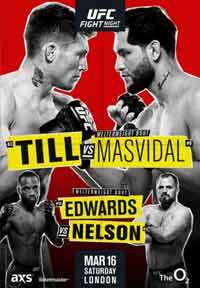 Silva vs Roberts is on the undercard of Darren Till vs Jorge Masvidal – UFC Fight Night 147 (UFC on ESPN+ 5). Watch the video and rate this fight!